The Windmill Hill Pinnacle Association [WHPA] invites the public to celebrate the recent gift of land to WHPA by the Radford family. A ribbon-cutting ceremony from 2 PM to 2:30 PM on Sunday September 9 will open the new Radford-Smith Trail that leads from WHPA’s ridgeline Cascade Trail down the hill – with picturesque overlooks, switchbacks, and balconies – and across the stream to Grassy Brook Road in Brookline and parts west. 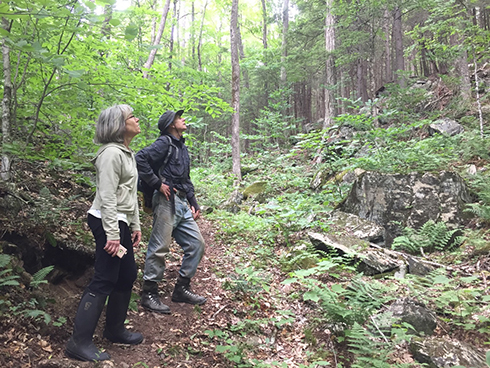 In 2017 Terry and Edna Radford of Atlanta, GA, gave 55 acres of land to WHPA to make the new trail possible and to expand the protected habitat of the larger WHPA holdings. 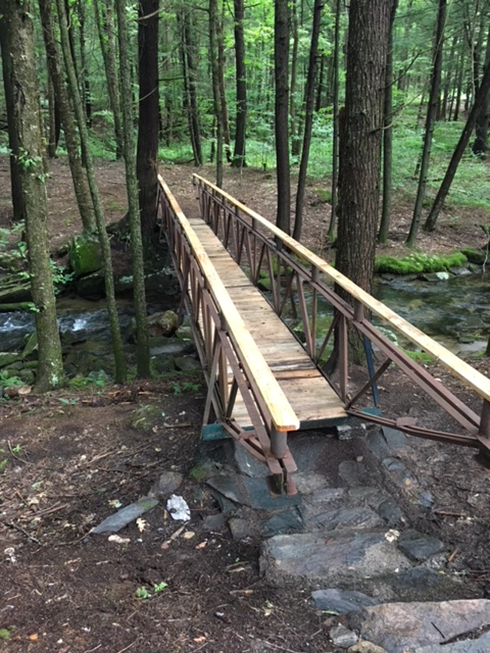 The Radfords also funded a unique footbridge created by master carpenter Phil Pellerin, who renovated the cabin at the Pinnacle overlook in Westminster. A small parking area beside Grassy Brook Road was created by Sam Bourne of Sam Bourne Landscaping and Excavating in Brookline, who donated his expertise and machinery to make parking for the trail more accessible. The Radford-Smith Trail – which is a testament to a love of nature and also a memorial to Paul Smith, Terry Radford’s boyhood friend – was created by long-time Pinnacle volunteer and trailblazer Roger Haydock. During the brief ribbon-cutting ceremony the Radfords will share their motivation for the land gift and support for the newest trail that adds 1.2 miles to the previous total of 25+ miles of trails the Pinnacle Association maintains from Putney Mountain to Grafton. Roger Haydock, who chose the route for the trail and designed and built it, will briefly describe the remarkable features of the terrain and how he plotted and created the trail through it. Those interested in learning more about the land gift, trail project, and construction of the footbridge are encouraged to park along Grassy Brook Road in Brookline to walk to the trailhead, which is located directly opposite 1195 Grassy Brook Road. Parking is limited, so carpooling is requested. We are on Facebook at https://m.facebook.com/windmillhillpinnacle/. At junction of Westminster Road and Route 121 in Saxtons River, follow Route 121 West 3.1 miles to intersection with Route 35. Go left onto Route 35 S towards Brookline and travel 1.3 miles. Bear left at Y onto Brookline Road (which becomes Grassy Brook Road at the Athens/Brookline town line). Follow for 6 miles to Radford-Smith Trailhead on left. Travel north 2.3 miles on Grassy Brook Road to Radford-Smith trailhead on right.